One day I was fiddling around on Instagram and saw a post about Coco & Eve Like A Virgin Hair Masque. Immediately I was intrigued so I clicked on the Learn More link and went to their site. I read about the mask and saw the ad. I was hooked. I desperately needed something for my frizzy, tangly hair. This mask promises to help untangle and de-frizz hair like no other conditioner. So I bought it. The regular mask alone with its special detangling brush was $44.90. I received it about two days ago and because I have such long, unruly hair I only wash it about once or twice a week at the most. My scalp is very dry and doesn't produce any oil at all. I can go for weeks without it producing any oil actually. I used it this morning and here are my results. The 'masque' is made from ingredients sourced in Bali, such as coconuts and figs. It is a 5-in-1 treatment restores dry, damaged hair, improves hair texture and shine, hydrates and deeply conditions, treats split ends and tames frizz and transforms hair in only 10 minutes. It is sulfate-free, phthalate-free, paraben-free, color safe, gluten-free, cruelty-free, and PETA approved. This product can be used in two ways. It can be used the regular way, such as applying to hair and then using the included detangling brush to apply the conditioner throughout the hair and rinsing out after 10 minutes. Or if you really want to deeply condition your hair, apply, spread throughout hair with the brush then leave on overnight and cover you hair with something to keep it from drying out (saran wrap or the microfiber hair wrap the site sells would work). The rinse out in the morning to hair that is so soft and amazingly tangle free. I found this hair masque to work exactly how it said it would work. My hair is so soft and feels like brand new hair. It is not frizzy anymore. I did apply some styling products to it but it is completely different than how it usually is after I wash and condition it. 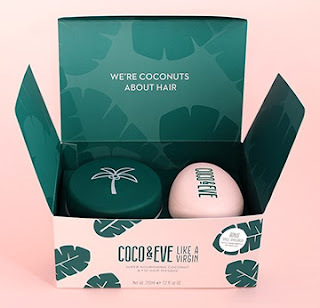 I feel that the Coco & Eve Like A Virgin Super Nourishing Coconut and Fig Hair Masque does an incredible job of making hair feel soft, detangled, de-frizzed, shiny and looking amazing. I really love how shiny and soft my hair is. And especially how it doesn't tangle as easily anymore. My hair is normally very dry and tangles easily. I get knots in my hair because although I have a lot of hair hair (it is thick) my hair is fine to medium in coarseness. This hair masque leaves my flaming red hair so darned shiny I feel like I am on fire! Coco & Eve Like A Virgin Super Nourishing Coconut and Fig Hair Masque is availbable from www.cocoandeve.com. The mask and brush alone retail for $44.90. There are other options available, check the website for details. Like Coco & Eve on Facebook: https://www.facebook.com/CocoAndEve/ and Follow Coco & Eve on Instagram: https://www.instagram.com/cocoandeve/.